Metal sheds are a fantastic alternative to having a wooden shed. They enable you to overcome many of the maintenance problems that you often encounter with timber structures. However as we’re all aware metal sheds themselves can suffer from condensation problems. Read on to find out how to alleviate this problem. All metal garden sheds will suffer from condensation where damp is present in the foundation. This occurs when a damp proof course has not been built into the base . Air inside a shed is slightly warmer than the air around it outside so any moisture in the foundations will rise until it touches the cool exterior metal panels and cools forming condensation. This moisture then will drip down and will become part of the cycle once more. Because condensation is so difficult to stop it is essential that you prevent damp in the first place by ensuring you take proper action when constructing the base of your shed. * Always make the concrete or slab base only a few inches larger than the base rail of the shed. * A damp proof membrane must be inserted into the foundations. It needs to be put into the base at least two inches higher than the surrounding ground level. * Allow the foundations of the shed to cure for 3-7 days after laying the concrete. Do allow longer if the conditions are damp. If you fail to do this the water drying up from the concrete will provide moisture to start a condensation cycle once your shed has been erected. * After you have bolted your metal shed to the concrete or slab base apply a silicone or mastic sealant to the inside of the shed base rails. (Please note it must be the inside and not the outside). By doing this you will preserve the drainage capacity of the channels whilst preventing any water seepage under the rails and into the shed. Detach your shed from its base and build a timber floor a few inches larger than the base measurements of the shed put this on raised bearers. Next fix the shed to the timber floor securing with wood screws and mastic seal the inside of the shed base rails. By doing this you are allowing air to flow under the floor enabling it to keep dry thus eliminating the problem. Please remember with this method to check that water cannot pool under the floor as this will stop the ventilation and render all of your hard work useless. An alternative tried and tested method of eliminating condensation from your metal garden shed is to clean off the underside of the roof panels with a methylated spirit making sure all panels are dry, then purchase polystyrene tiles and attach them onto the underside of the sheds roof using a specialist spray glue that bonds polystyrene to metal and is not affected by the hot or cold. It is best to carry out this work on a warm day. Both the tiles and the shed roof should be coated and after 2 minutes the surfaces can be bonded together. By using this method you will not be eradicating the moisture in the atmosphere within your shed however you will be able to prevent condensation now that your shed has been insulated. 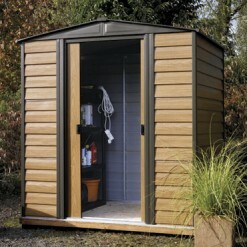 For a great range of metal sheds visit Jacks Garden Store now. I have read this article and found it useful, but my problem is that the structure is a pre-fabricated garage with a flat galvanised steal roof with a few corrugated parts in it. In the winter, or colder months, as you can imagine it drips inside with condensation badly. As the structure can't be altered or moved would fitting the polystyrene tiles to the inside of the roof, and painting the outside to stop my problem. If so and painting the outside would make a difference also, which type of paints should be used for the Inside and outside. Many thanks for your time, please reply to my email address. Fitting polystyrene tiles would help fix this problem. Make sure you complete this on warm day. A cheaper alternative would be to use bubblewrap. I have reasently had a fully insulated metal shed installed on a concrete base and am having problems with dampness which is bad. I have also found out that the base did not have a dampness membrane installed when the base was being put down. Everything in the shed feels damp as does the floor. Is there any way to cure the problem eg with water sealers or like wise products. What would you recommend is the best course of action for me to take to solve the problem. Kindes't Regard's. James. Thank you for your email. Water sealants will not be 100% effective in solving the problem but they will help. The key is to allow good ventilation into your shed to solve the damp problem. Erecting a raised floor made from 18mm OSB/Sterling board will help fix the problem and is pretty resilient. My problem is that I can't fit poly or Bubble Wrap or move the Unit. It is a 24' x 10' concrete store with corrugated roof. BUT. It will be used to store for Fireworks – thus can't use anything that is flamable. My options are limited as I know, I have a concrete base which I could 'build up' inside the unit by about 2" if required. I could cut some small holes in the sides, just below the roof line, for ventilaton if this would help. I could also paint the underside of the roof if there is anything on the marlet that would help. How thick should the polystyrene insulation be? Previous post: How long do pet rabbits live? Next post: Top winter vegetables to grow in your garden.